Traveler, gambler, lover but above all passionate. These are some of the traits that describe the personality of one of the greatest war photographers of all time: Robert Capa. Often controversial, always on the move, he stumbled into photography a bit by chance when still very young he relocated from his native Hungary to Berlin and could not find a suitable job as a writer (his intended initial career). At that time he was not even known as “the great American photographer Robert Capa” that is the name he created later on to boost his photography career, but by his original real name – Endre. And as many other big careers, he got his “golden moment” while covering a speech delivered by Leon Trosky and took the picture that made his name known to the world. And he got close enough for sure, this we can clearly see in the picture sequences he produced named: the dead of an American soldier (Spanish civil war) and the D-day landings (World War II). In these series of pictures we can appreciate how close Capa would get to the actual fighting while taking pictures. This closeness to the action would give him the opportunity to be inserted with the military units he worked with as a regular and live with them the dynamics of the war first hand providing him with a unique position to interpret all the things happening around him with a combination of “artistic eye” and actor rather than bystander. I can only imagine the courage it took to jump into those trenches with bullets and shrapnel flying around armed only with a camera and some film, but Capa would not have any other way, that was his passion, his calling and his mission. And it was this passion that also took Capa away when he stepped on a land mine in Indochina in the early 50’s during an assignment he accepted after his “retirement”. Besides his outstanding graphical work, Capa left us another legacy… he was one of the founding members of Magnum Photos. A worldwide agency that manages a very high quality photojournalism photo stock. 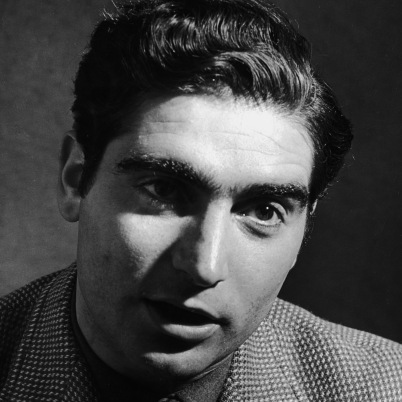 Thanks to his work, and his legacy Robert Capa will be always be remembered and at least for me is one of the artists I look up to in photography.